People who carry the APOE4 genetic variant face a substantial risk for developing Alzheimer’s disease. 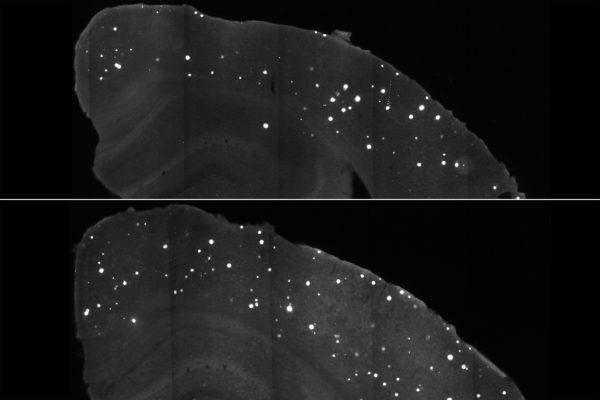 Clumps of a damaging Alzheimer’s protein (white spots) are scarcer in the brains of mice treated with a DNA-based compound (top) as compared with those given a placebo (bottom). The compound targets APOE4, a genetic variant that magnifies a person’s risk of the disease. The findings suggest that targeting APOE could potentially prevent or delay onset of Alzheimer’s. Credit: Tien-Phat Huynh, Washington University School of Medicine in St. Louis. This article has been republished from materials provided by Washington University School of Medicine in St. Louis. Note: material may have been edited for length and content. For further information, please contact the cited source. Huynh T-PV, Liao F, Francis CM, Robinson GO, Remolina Serrano J, Jiang H, Roh J, Finn MB, Sullivan PM, Esparza TJ, Stewart FR, Mahan TE, Ulrich JD, Cole T, Holtzman DM. Age-dependent effects of apoE reduction using antisense oligonucleotides in a model of β-amyloidosis. Neuron. Dec. 6, 2017.